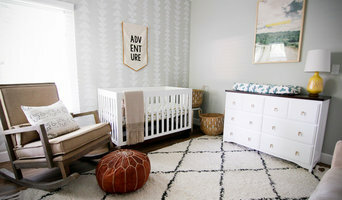 Nursery and Children's Room Interior Design If you're an expecting mommy or already have a little bundle of joy, Rockabye Mommy specializes in creating chic spaces for pampered babies. Nurseries, kids rooms and playrooms can be as simple or elaborate as your budget allows. While you'll want to create a warm, welcoming space for your baby or child, safety is the most important consideration when designing a child's room. As an expert in children's room interiors, Stephanie will create an imaginative, whimsical and safe environment for your child to play, sleep and grow. With service offerings that include: full service interior design and e-designs, RM will have you ready for baby before you know it! Rockabye has been featured in InTouch Weekly Magazine, OK! Magazine UK, People.com, California Homes Magazine, Riviera Magazine, Orange County Register and Projectnursery.com. With 17 years experience in the juvenile industry, I have taken on the adventure of designing spaces with my own business. Emerson Grey Designs was started after the birth of my second child. Designing is a passion that I have had since my childhood and with the experience of designing the custom bedding, furniture and spaces for a high-end baby boutique for 13 years, it was time for me to branch out on my own. I specialize in e-design. I know that not everyone can afford hiring a designer to take them on a step-by-step journey of creating the space of their dreams. That is where I come in! Designing special spaces for your baby on the way or the little one already in your life. Follow me on this journey...maybe you'll be the next space I design! Shop for great nursery ideas from shabby chic furniture and accessories to nursery lamps. Charn & Company offers the best selection to custom design your boy nursery or girl nursery. Choosing the best wood chandeliers, table lamp, floor lamps, cottage style wall sconces, or pendant lighting is easy. Our popular Bella Collection features great shabby chic decorating ideas for home. Hand applied appliques are delicately applied to create a unique vintage look to our wall decor, room decor, and personalized gift items. Our goal is to provide moms with the nursery of their dreams! You tell us what you have been hoping for, and we will provide you with a drawing and the exact details on how to make your dream nursery a reality! As a design professional, we can also offer interior decorating consultations for any room in your house. We use the full benefit of our trade resources, and we will handle the design from top to bottom. Quality service and customer satisfaction come first at Casa Bebe. Give us a call today, we'd love to hear about your project! We love kids spaces. And we think you shouldn't have to compromise style for function when it comes to your little ones. Our products bring together a sleek style and convenience to fit your space and decor. Our minimalist approach to design creates a modern feel for your nursery or big kids' room that grows with your child. At Cotton Tale Designs, we know designing your baby’s nursery is no small affair. We know a nursery is far more than just a place to change your baby’s diapers and put them to sleep. It is a place for you and your baby to share unforgettable moments, to develop a bond and a love that is unlike any other. Only you can determine what you will need to create this intimate place for you and your baby to grow, bond together, and bring comfort to each other. For over twenty years, Cotton Tale Designs has had the pleasure of helping mothers breathe life into their nurseries, helping them to create spaces that will freeze time and create treasured and irreplaceable memories. We believe your nursery should be just that place. We believe that not only should your nursery be as functional as possible, but it should also work for you. Your nursery should envelop you within its comforting energy, protecting you and your baby, separating you from the outside world. When you gaze into your nursery and see your baby resting peacefully, you should feel that same peace with the way it looks. Designed by a father, made with love. We designed wooden toys with a hint of vintage essence. What does a Mead Valley kids room and nursery designer do? Most designers who specialize in decor for kids’ rooms and nurseries will tell you that a child’s room isn’t just for sleeping in. Little ones need a space where they can learn, play and sleep safely. Furniture, blinds and even lighting have to work safely for both you and your little one. Whether you’re hunting for small or large brands, make sure you chat with your Mead Valley, CA designer to make sure that what you buy meets safety requirements. Find kids’ room and nursery professionals on Houzz. Narrow your search in the Professionals section of the website to Mead Valley, CA kids’ room and nursery designers. You can also look through Mead Valley, CA photos to find a room you like, then contact the designer who worked on it.